What did I do that I have my upload limit increased to over the 15 minutes, unlike the other mortals? Don't know but surely enjoy it, I was limited before and not linking it. Then the second question: how can I ensure my videos are available ASAP for delivery in the WebM format? (I upload in Ogg Theora, Kdenlive in F14 still does not have WebM export, I need Theora also for blip.tv and don't want to transcode once more with my pity CPU). 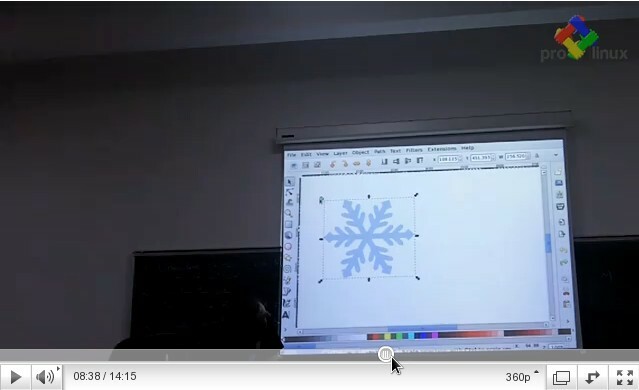 But enough blabbering, yesterday at the monthly RLUG meet I continued demoing Inkscape drawing from December (people asked for it, I couldn't refuse) with making a snowflake (yup, I know we are all feed-up with the winter and looking forward to the spring but... it was requested). As you already suspect, the video recording is up on YouTube, unfortunately not yet in WebM, and also is free format on blip.tv, together with the other RLUG recordings (the other two videos from yesterday are still processing). Of course, there are also some photos, but they are just usual, nothing extraordinary. And sorry... I have no formal slide, since you can't do one for such a presentation. Maybe, just maybe I would put myself to work one day and do a tutorial one day, but don't take this as a promise.